OK, you will probably see mushrooms popping up from the ground near trees or in your flower beds, because we should have winter rains triggered by a strong developing El Nino. This is a very good sign. Don't disturb the mushrooms, let them be - they are beneficial. And some of them can be very colorful. 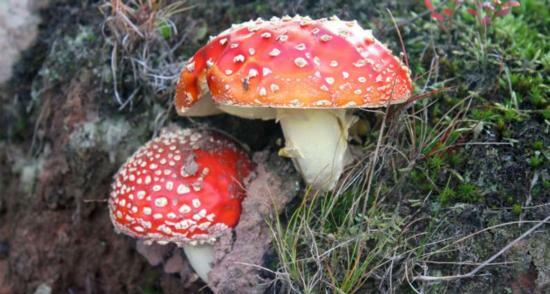 Above is the fly agaric mushroom (Amanita mascara) which trades resources with birch and pine trees. Such fungi are symbiotic and have a cool toolkit - its mycorrhizae hyphae boost a plant's root system efficiency and routinely help some 85% of plant species, including most land-based plants. The plant benefits from a vastly extended root system and improved mineral uptake, while up to 20% of the carbon compounds made by the plant can flow into the fungus. Fungi are partners with plants in the soil. They connect many plants together improving nutrient exchange; they supply water to plants; they protect plants from root-feeding microorganisms; and they improve soil structure making space for both water and air. More on paying attention to mushrooms is found here, and on symbiosis is found here. With so many plants benefitting from mycorrhizae hyphae it is true to say we would have little to eat without fungi.